Customers in Central Virginia choose Shogun Services to install, repair, and replace lighting fixtures in their home or business. Good lighting throughout your home is essential for your peace of mind, and Shogun Services can help you make an upgrade to your existing lighting, or work with new homeowners to get everything set up properly out of the gate. Shogun services can work in any room in the house. We’ve upgraded lots of Central Virginia kitchens and bathrooms over the years, and can advise you on what types of light fixtures are best for the room or business situation. Installing new light in your home or business has many advantages. Shogun Services can install new light fixtures that use modern energy efficient technology to get a better lighting output and decrease your energy bill. We can handle ceiling fans, chandeliers, wall sconces, vanity lighting in your bathroom, LED lights, etc. Whether it’s a modern kitchen or bathroom upgrade, or just time to brighten up your home or business, Central Virginia relies on Shogun Services to handle all of their lighting needs. All of our technicians are trained knowledgeable on what lighting works best in your home, and will advise you on what brands and models work within your budget. 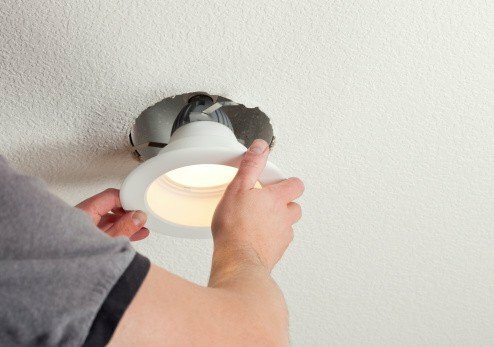 When we put in new lights in your home, we make sure to do a complete job, including working with any drywall or moulding if necessary. We will remove any of the old light fixtures and clean up our mess to leave your home or business looking nice, bright, and clean with a beautiful finished product.